A rash of gruesome murders at a circus owned by ringleader Monica Rivers (Joan Crawford) brings a Scotland Yard detective (Robert Hardy) onto the scene to investigate. This disappointing murder mystery — best known for starring a well-preserved 63-year-old Joan Crawford — ultimately provides few genuine thrills, and fails to live up to its campy potential. While Crawford is clearly enjoying playing yet another “strong female” — an independent woman who easily attracts and beds men of all ages — the script simply doesn’t do her character justice. And though the identity of the serial killer is nearly impossible to guess, this is less a function of cleverly written suspense than of outright improbability; revelations are tossed out in the final scenes of the movie which make little sense given what’s come before. The circus poodle act — ultimately more interesting than the rest of the film! No. I’m not sure why Peary lists this as a “must see” in the back of his book — I’m assuming it’s because of Crawford’s late-life performance, but you’re better off watching her in true camp classics such as What Ever Happened to Baby Jane? (1962) or Strait-Jacket (1964). Unless you’re hell-bent on seeing every Joan Crawford movie (and I know ‘you’re’ out there), this is not a must. Even ‘Trog’ (JC’s last feature film, 3 years later) has more to offer. (Of course, don’t tell my friend Tom that. 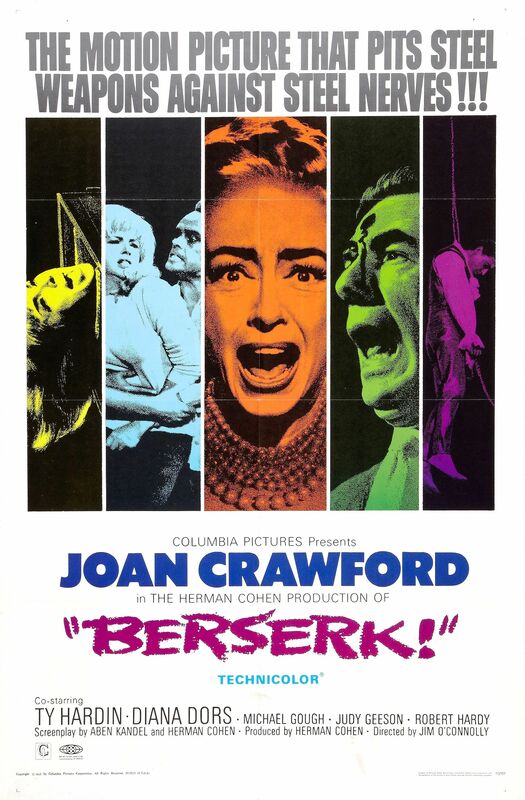 If you even imply that ‘Berserk’ is maybe one to miss, there will be a pause, perhaps a faux icy stare, and a slow “Every…Joan Crawford…movie…is…a…must. …Period.”) Its main problem as camp is that it all feels so labored. Yes, there are some laughs (not aimed for) but not at all like those derived from such consistently uproarious JC camp classics as ‘Female on the Beach’, ‘Queen Bee’ and ‘Strait-Jacket’, all of which (unlike ‘Berserk’) have lots to delight time and again. I’ve seen ‘Berserk’ a few times, each time seeming more of a chore. Though a first viewing is not a total waste of time–Joan could pretty much be depended on for giving 100%–it’s rather trivial, with little payoff.